We've all taken those classes; you know the ones that bore you to tears. The teacher, professor, or education consultant stands up in front and drones on and on about some topic or another. We are expected to sit up, pay close attention, and learn as much as we can. How many of you actually can do that? I know I can't. My mind starts to wander. If there's a window nearby, I tend to look out it. I usually daydream about different ideas for my classroom, wish I could be grading papers or doing something more useful, or simply start thinking about what I have yet to do that day. Wherever it is, my mind is not on learning. Take some time to think about a boring class you had to endure, whether recently or in the distant past. What about that class made it boring? What did you do when you got bored? What would you have liked to do in that class? Now, take some time to think about the classes you teach. Do you find your students staring out windows? Do you notice a lot of attention spans drifting while you teach? Before we can address the subject of motivating students, we first need to determine whether we are having a problem or not. If there is a problem, what is causing it? Do you notice yourself lecturing more? Are you doing the same exact thing day after day after day? When you talk to students do you use a monotone voice? Take some time to analyze what's happening in your classroom. Once you've done that, try a few of the suggestions below to pep up your class. Plan in shorter time segments. The attention span of students ranges from 5 minutes in the youngest students (kindergarteners) to 20 minutes in the oldest students (high-school seniors). That means, if you plan a single lecture or activity that takes 20 minutes or longer, you've definitely lost the attention of your entire class. Break up your lesson into shorter segments. For example, you might spend 5-10 minutes on your focus activity. The focus activity either should review material learned the day before or get students focused on what will be learned that day. Then you might spend 10-15 minutes on an introduction and mini-lesson teaching about the topic/concept. Depending on students' age and skill level, plan 10-20 minutes for an activity that practices and/or applies the skill you taught. Then you can end with a short closing activity. Activities should be shorter and more frequently changed in the younger grades, and longer in the upper grades. Vary activities. If all you do pass out worksheets or read the textbook each day, no wonder everyone is bored. Even if you have a coloring or cutting activity, using it every day is overkill. Students get tired of doing the same thing day after day. Spice it up a bit. Create a scavenger hunt in which students search for classroom items related to a topic or find information in a textbook. Have students create a game that practices or applies the skill or topic they've learned. There are tons of great educational games that practice skills. Bring some of those in and let students play them. Have students work on the Internet, when available. Use paper-bags for projects, make mobiles, or create pop-up books. You can find many different creative ideas to use to practice or apply skills. Don't be limited by a textbook, workbook, or worksheet. Bring children's books and novels into your lesson. Even older students enjoy listening to someone read aloud. Many teachers assume that if they are not teaching K-3, then children's books are not for them. That is so sad! There are so many great books out there that cover so many topics we teach throughout the year. Are you teaching about Onomatopoeia? Read Mr. Brown Can Moo by Dr. Seuss, which contains lots of fantastic examples of this literary element. Are you teaching about habitats and nocturnal creatures? Try reading Stellaluna to your class. I love using children's books to introduce a new unit, to show them a skill used in literature, or even to simply present information. 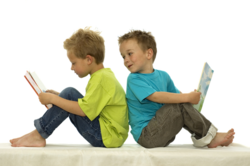 Children's books are generally short enough to read in a 5-10 minute period and are easy to understand. Students can get the same information in a more enjoyable format than the textbook or an encyclopedia. Many excellent non-fiction children's books are available as well. Not sure how to find them? Go to Amazon.com and do a keyword search under the topic/skill you are teaching. Search the children's books section to find something appropriate. Use the outdoors. We all love going outdoors, especially in spring when the weather is so nice. Is today a day when you must read out of the textbook? Then take everyone outside and read out there. It's so much more enjoyable. Use the sidewalk and chalk to make notations or solve math problems. Always be sure to have some task or assessment that will hold students accountable for their learning while outside. That helps make sure that students will stay more on task than off task. Actively involve students in the lesson. Do you find yourself doing most of the talking and working in class? That is another cause of student boredom. You might use Reader's Theater and assign roles to students from the textbook or novel. Have them stand or sit in front and read their parts. You might have student groups become "experts" on a section from the chapter you are studying and present their information to the rest of the class. PowerPoint presentations are an excellent way for students to share what they've learned. Find a different way of reading the textbook: have students work in pairs to turn a subsection of the textbook into a story or script, then have each pair share their story in the correct order. Math teachers can have students create a short story that either uses or solves the equations they are learning. Again, there are so many different ways to get your students involved, even in the most boring task. If you really want to motivate your students, it's time to pull away from the worksheets and think out of the box. Although it's easier to simply pull out the worksheet or workbook that comes along with your textbook, it is also less motivating. Take some time to think about how you can get students learning or practicing the same information in a different way. Don't try to do every lesson at once. Take it one lesson at a time. Start with one and then move to two lessons a week. Slowly increase until you are able to plan lessons with interesting and motivating activities throughout the week. Before you know it, you'll have a motivating class full of students who are learning and loving it!